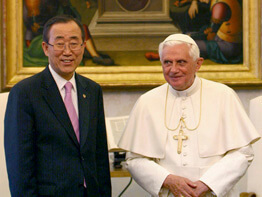 VATICAN CITY – U.N. Secretary-General Ban Ki-moon invited Pope Benedict XVI to visit the United Nations headquarters in New York during a private meeting at the Vatican. The two leaders discussed global trouble spots and cultural tensions during a 20-minute encounter in the pope’s private library April 18. It was the first papal audience for Mr. Ban, a former South Korean diplomat who took up his U.N. post at the beginning of the year. A Vatican statement said the pope and Mr. Ban had discussed the need for a “restoration of multilateralism” in international affairs and the strengthening of the dialogue between cultures. The Vatican confirmed that, as expected, Mr. Ban had officially invited the pope to visit the United Nations. Vatican sources have said the pope would like to make the visit, and that one possible time frame was in late September, for the opening of the U.N. General Assembly. To date, no firm plans have been made for such a visit, the sources said. It would be Pope Benedict’s first visit to the United Nations and his first visit as pope to the United States. Pope John Paul II addressed the United Nations in 1979 and 1995, and Pope Paul VI did so in 1965. After meeting the pope, Mr. Ban held extensive talks with Cardinal Tarcisio Bertone, the Vatican secretary of state, and Archbishop Dominique Mamberti, the Vatican’s foreign minister. The Vatican said Mr. Ban’s visit served to highlight the contribution that the church and the Holy See can make toward resolving conflicts and promoting global understanding. The Vatican also expressed its appreciation for the United Nations’ central role in maintaining peace and promoting development.